Sheffield United dimiss David Weir. 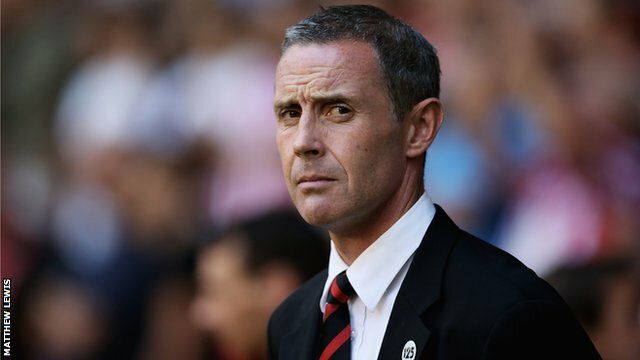 Ahead of their game with Coventry City at Sixfields on Sunday, Sheffield United have sacked manager David Weir. The Blades have failed to win in their last nine games, following an opening day win over Notts County in the league. In total, Weir only managed 13 games in charge of the club and leaves the club sat 22nd in League One with a record of two wins, two draws and nine losses. On Tuesday, The Blades were knocked out of the Johnstone’s Paint Trophy by League Two side Hartlepool United. Former Coventry City midfielder and coach, Lee Carsley, who only left to join up with former team mate Weir at Brammall Lane in the summer, has also been relieved of his duties. “First and foremost all at Sheffield United, from the board right the way through the club, wish David and Lee all the best for the future. Chris Morgan will lead the side as The Blades travel to Sixfields on Sunday afternoon. « Leon Clarke: Swindon & Di Canio forgotten about.